Boikhantsho Primary School - Maths Day. Following its investment in computer literacy training for teachers at Boikgantsho Primary School in Mamelodi, Sage VIP Payroll & HR has deepened its relationship with the school by taking a stewardship and sponsorship role in its math and reading programmes. 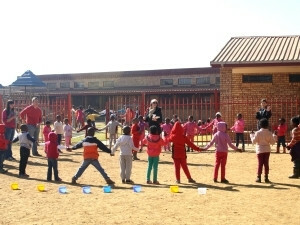 This forms part of Sage VIP's social investment partnership with the school, facilitated by their joint involvement in the Tshwane Partners for Possibility (PfP) Programme from Symphonia South Africa. The reading programme at Boikgantsho Primary School began with Sage VIP's support during August 2013, with the intention of formalising and strengthening the reading programmes that were running in the school's classrooms. 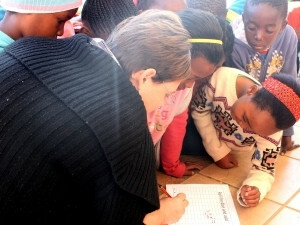 Under the programme, grade 1 to 7 learners read aloud to the teacher and classmates every Friday morning. Each month, they compete for the grade reading championship, with the winner from each grade receiving the floating sash to wear for the month and a pin that is theirs to keep. At the end of the year, the school crowns the top readers from the junior, intermediate and senior phases as winners. The winning learners and their parents receive a cash prize. The school has also introduced a colour pin for the amount of books read per month so that everyone has a chance to win something. School principal Ab'e Kob says the objective of the programme is to create a culture of reading by involving educators, parents, and the society around the community. This programme has been so successful in its goal of getting the schoolchildren motivated to improve their reading skills that Boikgantsho Primary has kicked off a similar math championship for Grade 1 to 7 learners. "We've seen a real and sustainable improvement in the children's reading skills over the past few months. They compete for the sash each month in good spirit and the winners wear it with real pride," says Annemien Victor, director of consulting at Sage VIP. "It's really great to see how the parents are getting involved, too. By unlocking their love of reading, Boikgantsho is equipping its learners to excel as they move through high school and into university in later years. And we expect the maths programme to be just as successful." The PfP Programme partners business leaders with school principals in an effort to improve education outcomes. Victor says that this relationship has been rewarding for her personally and for Sage VIP. "Principal Abe's energy and excitement is truly inspiring," she says. "I feel this programme is achieving so much because it focuses on possibilities instead of problems within the school environment." Sage VIP and Victor first got involved in the school by facilitating a basic computer skills training course for teachers. But Sage VIP looks forward to doing even more work with the school in the years to come in an effort to enhance the quality of education and improve the school environment, says Victor.